Sergio Garcia holed an eight iron from 148 yards for eagle during a five-under 65 that gave him a share of the lead after the Honda Classic's first round. As well as his two on the par-four second, the Spaniard, 36, added four birdies and a bogey to sit alongside American Michael Thompson in Florida. 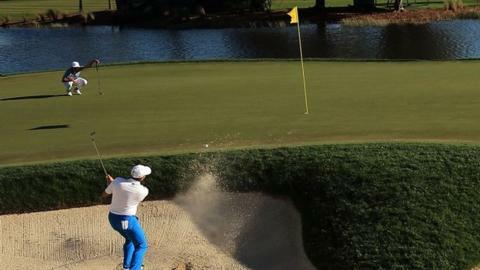 World number five Rickie Fowler shot a flawless 66, with Ireland's Shane Lowry a stroke further back at PGA National. Rory McIlroy is seven shots off the pace at Palm Beach after an erratic 72. The world number three, who won at PGA National in 2012 to assume the top ranking for the first time, was one under after 13 holes. But the Northern Irishman, 26, took six on the 14th after finding three different bunkers and, after a birdie on the 15th, bogeyed the 16th and 18th, the latter with a three-putt from 10 feet. America's Phil Mickelson is one of nine players on one under par, a group that includes England's Paul Casey and Greg Owen. McIlroy's playing partner, defending champion Padraig Harrington, carded a 73 which included a double bogey after losing a ball in a palm tree on the 10th. Garcia, who missed the cut in the Northern Trust Open last week, dropped just one shot in windy conditions, although that bogey was not his biggest worry on the sixth hole. After pulling his drive into a lake, the Ryder Cup star elected to take off his shoes and socks and splash out from the edge of the water - but was anxiously looking over his shoulder for signs of any alligators nearby while in the hazard. The world number 19, playing alongside Fowler, emerged unscathed and responded to the dropped shot with birdies on the seventh and eighth. He then made pars at the next nine holes before a two-putt birdie on the 18th. "I took it quite easy this week after playing terrible last week so it was nice to go out there with low expectations and I was able to play well," Garcia told Sky Sports. "I hit two really good shots on the first and hit a good putt but just missed it right, and then on two I hit a great drive and a beautiful eight iron and managed to hole it. "It's funny because the last six or seven times Rickie and I played together either he holed out or I did. Today we both did and it's always nice to see," added Garcia, after Fowler emulated his eagle on the second by chipping in for par on the 10th.